The lesson establishes that internally the greatest threat to the church is false prophets and those who teach their heresies by asking us what are some of the warning signs Peter is referring to in 2 Peter 2:18. The greatest sign of false prophets is that they teach some form of a 'another gospel' which is the topic that will be covered in tomorrows commentary. The primary text for this week's lesson is 2 Peter 2:1-22 where Peter warns of false prophets and teachers. "It’s sometimes easy to idealize the early church, to think of it as a time of great peace and harmony among the earliest believers in Jesus." The words of a true prophet are the very (exact) words God puts into the prophet by God. If anyone comes to you claiming to have a gospel message from God about anything other than the death, burial and resurrection of Jesus Christ for the atonement of your sins and the salvation of your soul then that is a person who Paul has placed a curse upon and is either a false prophet or teacher teaching the heresy Peter is warning you about. Monday, June 5: Freedom in Christ? "What is Peter warning about in this verse? What does he say in 2 Peter 2:19 that helps explain his concern? What is the importance of the word freedom (NIV) or liberty (NKJV) in verse 19?" Peter's warning is that if your faith has been placed upon false teachings, meaning a false gospel, your faith is in vain and you are not in the kingdom of God. Peter was particularly concerned about the fate of those whom the false teachers entice back into their former sins (2 Pet. 2:18). It should be noted that the lesson title is a phrase which comes at the end of this chapter where Peter includes a quote from Proverbs 26:11. As the lesson indicates, the theme of this chapter is critically important for all Christians to understand. Peter in 2 Peter 2:18 identifies two groups of people. The first are those "speaking loud boasts of folly" which has been identified as false prophets and false teachers. The other are those "who are barely escaping" from those who are still unsaved sinners. Peter calls them are "fools" therefore both groups could be those who return to eat their own vomit or wallow in the mire of sin regardless of how saintly they make themselves appear to be. True prophets and those who teach true biblical doctrines, especially doctrines that support faith in the completed work of Jesus at Calvary, will have love for all who are in the kingdom of God. Know that this is not about which 'man created' denomination you are a member of. Rather this is about all those who are or are not covered by the shed blood of Jesus Christ. Therefore false teachers of the words of a false prophet will identify themselves to the world by the discord and hatred they generate towards true members of the kingdom of God. This seems to be the reason Peter says a person who teaches such heresy is "the dog (who) returns to its own vomit". 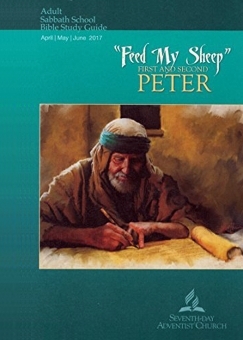 In this lesson 2 Peter 2:1-3:7 is compared with Jude 4-19 and then makes the claim this repetition shows "that God means business in dealing with sin". Yes there are similarities between these two passages of Scripture and it is worthwhile to take note that both contain a warning from God. However it is only an assumption "that God means business in dealing with sin" because the warning has been repeated. For instance, there are four gospel books included in the New Testament of the Bible. However you could possibly only read and understand one of the four to learn and respond to the message that Jesus died to atone for your sins. Adventist fail to question and learn how Adam and Eve died on the very day they sinned, yet God only needed to say it once to know God means what he says. Adventist theology fails to understand and know that when he created Adam in his image mankind was created with a human spirit and that our spirit is what died on the very day Adam and Eve sinned. Jesus only needed to tell Nicodemus one time (John 3:1-21); “Truly, truly, I say to you, unless one is born again he cannot see the kingdom of God” and have eternal life. Jesus is talking about the rebirth of a sinner's dead human spirit they have at physical birth (born of the water) before entry into the kingdom of God can occur. Furthermore no matter how many truly good works you may or may not have to your credit, none of that can bring your spirit to life. Only the shed blood of Jesus at Calvary and his gift of the Holy Spirit can cause that to happen. The lesson makes it appear that Adventist are among those who need to be told over and over before they believe God means business in all that he says. When God repeats a message this simply reveals his love, forbearance and patience with sinners. Today's lesson is commentary on 2 Peter 2:6-16. "Peter used Balaam as an example of those enticed by adultery and greed (2 Pet. 2:14, 15)." If you turn to the original account (Numbers chapters 22-24) you will find that Peter accurately cites the original. Balaam's guilt was that of 'loving gain from wrongdoing'. This is not the same as the sin of adultery. Today's lesson engages in a bit of Ellen G. White double talk when it says; "So often we hear Christians talk about 'freedom in Christ.' And, of course, this is a valid concept" but goes wrong by introducing an Ellen G. White quote in an attempt to show that 'something more' is required for our salvation. “The great truth of our entire dependence upon Christ for salvation lies close to the error of presumption. Freedom in Christ is by thousands mistaken for lawlessness; and because Christ came to release us from the condemnation of the law, many declare that the law itself is done away, and that those who keep it are fallen from grace. And thus, as truth and error appear so near akin, minds that are not guided by the Holy Spirit will be led to accept the error and, in so doing, place themselves under the power of Satan’s deceptions. In thus leading people to receive error for truth, Satan is working to secure the homage of the Protestant world.”—Ellen G. White, Christ Triumphant, p. 324. It is entirely correct to say “The great truth of our entire dependence upon Christ for salvation...." but what she's says next 'in the same breath' is nonsense. Our salvation is totally a work of Jesus Christ. Anything we could possibly add to this message cannot be the biblical salvation message. It is Ellen G. White herself who is guilty of both presumption and heresy. An issue not understood or simply ignored by Adventist is that Jesus clearly said your spirit must be born again via the indwelling Holy Spirit which is freely giving to all those who come to Jesus in faith for the atoning blood he shed at Calvary. At that point you are no longer in the kingdom of darkness (the kingdom of lawlessness) because you are eternally secure in the kingdom of God. Ellen G. White is wrong to claim that only the "moral law" (a non-biblical concept) was done away with by Jesus' death at Calvary. No, according to Jeremiah the whole Old Covenant with all the law contained within it would be done away with and replaced with something else. It is the whole Old Covenant, not certain parts of it that is gone. Furthermore, those who are born again and in the kingdom of God, are not preaching lawlessness. The Old Covenant law was one whole indivisible law. To arbitrarily define certain parts of the law as "ceremonial law" and therefore the only part no longer applicable to the New Covenant is a false non-biblical concept. Remember, Jesus replaced the Old Covenant, not just the law it contained. That means everything of and within the old has been replaced with something new as was prophesied by Jeremiah. The law promoted in Adventism is this 'law of sin and death' which is now obsolete. At no time do Christians, those born again of their spirit by the indwelling Holy Spirit and eternally secure in the kingdom of God, teach anything other than obedience to their Lord and Savior Jesus Christ. Ellen G. White is the one who teaches "the error of presumption" because she advocates adherence to the wrong law, the law of 'sin and death'. Jesus command, which covers all his other commands, is that that the world will know who you are (Christians) by your love for one another, John 13:34-35. This means that those who teach anything other than love for those who are 'born-again' and in the kingdom of God are false teachers teaching the words of a false prophet. Copyright 2017 BibleStudiesForAdventists.com. All rights reserved. Revised May 28, 2017. This website is published by Life Assurance Ministries, Camp Verde, Arizona, USA, the publisher of Proclamation! Magazine. Contact email: BibleStudiesForAdventists@gmail.com.